We took some pics of this dress as well. AND I never get to wear it. This was a good excuse. I guess now I need to get Matt to take me to more formal events hu? wow! this dress is absolutely amazing/gorgeous. great photos too. That dress is gorgeous! I love hand-me-downs from grandmothers, etc. I love the feathers and how you used sheer fabric to change the photos. Both Grandma Vivian and Grandma Helen were trend setters..and so stylish..YOU HAVE TAKEN AFTER THEM..Grandma Helen used to have her hair cut just like yours and dyed the SAME COLOR and she wore the most stylish cloths!! And She sewed just like YOU!! DID YOU KNOW THAT???? you had some pretty cool grandparents!! Stunning. Where is the horse mural? Wow, these are lovely! 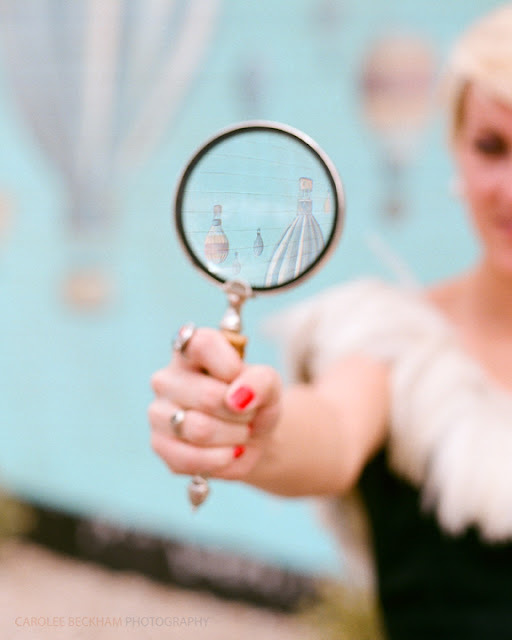 Very old-world styled... from the background, to the magnifying glass prop, to the stunning vintage dress (can you replicate it, please? ;)). I hope you'll have more chances to wear that beautiful heirloom frock! That dress is perfection! FABulous feathers.